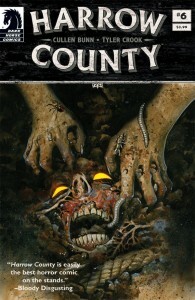 If you’re not reading Harrow County yet, it’s probably not too late to catch up, but let me add, WHY THE HELL NOT?! It’s October, Halloween is fast approaching and this book will send chills down your spine. Cullen Bunn really showcases his writing skills and versatility in Harrow County. I was a huge fan of his work on Night of the Living Deadpool and felt that he really captured Deadpool’s character. ‘Pool is supposed to be funny and until Bunn took on Night of the Living Deadpool, I hadn’t had a good laugh since early on in the volume 4 ongoing. Also, Hellbreak published by Oni Press is a truly unique story that I look forward to reading each month, if you aren’t reading that one either I urge you to pick it up. Ok, enough of my rambling about how fantastic Cullen Bunn is, (but seriously, Harrow County should solidify him as one of the best writers out there today) let’s talk about this story! *CAUTION* If you haven’t read Harrow County yet and don’t want spoilers, do not continue to read! We have now established that Emmy is thought (by the townspeople) to be Hester Beck reincarnated, and while Emmy herself may not believe it, she knows deep down inside her “witchery,” at the very least, has something to do with Hester. At this point Emmy realizes she has the power of witchcraft but wants to continue to use her abilities for the good of mankind, nothing reminiscent of Hester. On the last page of issue #5 we were quickly introduced to Kammi who happens to be Emmy’s twin sister that we never knew about. Apparently Kammi has just learned of Emmy and insisted on visiting her sister, seemingly coming from a wealthy family in the big city, she takes the trip to Emmy and Pa’s quaint little countryside home. They spend some time getting to know one another and as it turns out, Kammi possesses the art of witchcraft as well so Emmy is not alone. If you remember Jim Webb from issue #5, he brashly approached Emmy and asked that she make a young, dashing Thad Cribbets more…unsightly, if you will, since his wife Celia had been “makin eyes at him.” Emmy didn’t take to kindly to his request and informed him that she isn’t a mean person, but could quickly become one should her buttons be pushed. Well, in this issue Kammi decides to hop in her luxury car with her “butler” and head into town to see what it was like. As she walked around people greeted her as Emmy, not realizing that she was a twin, and she obliged everyone as if she were Emmy. She seemed to enjoy all of the attention. Jim Webb just so happens to be eating at the diner when he sees Kammi walk by (thinking she was Emmy and remembering her threats.) He grabs his steak knife and follows Kammi for a little while. When she finally approaches him he is surprised by the fact that she doesn’t remember him or his ugly request. She doesn’t pacify the notion that she is Emmy’s sister, but she implies that she knows her. When she asks what Emmy did to upset him Webb tells her how she turned down his request to run off ol’ Thad Cribbets. Shocked and appalled, Kammi verbally shames her sister…and then happily obliges Mr. Webb stating that “we’re gonna be great friends. the two of us…” On the next page we see what evil Kammi is capable of and poor Thad will likely never be seen or heard from again. My biggest question is: did Hester somehow split her personalities for her future reincarnations where Emmy is her good side and Kammi is her bad side? Maybe Kammi is Hester reborn and Emmy is her doppelganger born of the earth? Either way, there are enough good questions to keep me wanting more! Tyler Crook’s pencils and letters continue to amaze. No colorist is listed, however, I assume Digital Art Technician Ryan Jorgensen has some part in that. These guys keep the dark and ominous tones rolling with every page, coupled with Bunn’s script, this book continues to be engaging and visually horrific.